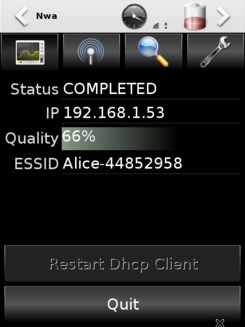 On OM 2.6.29 kernels wifi is broken, software putting down the interface (e.g. wpa supplicant in some cases) will break ar6000 module. A workaround has to be implemented and activable in the configuration file. A 2.6.29 rude workaround was implemented, when you quit the NWA it does not kill udhcpc and deconfigure eth0 from wpa_supplicant (always remove networks) but simply release the FSO WiFi resources, removing the interface without deconfiguring. It works only sometimes. We may think to rmmod/insmod ar6000 but it's a very crude hack and sometimes kernel opses.